Sunday’s dawn broke as a golden ball of fire, at first slowly creeping above the horizon, then gathering pace, up, up into the sky. I was spell bound by the mists, hovering almost ghost like above the river. And the light. Great shafts of light. Coming out of the cloud and firing downwards in straight lines towards the autumn countryside below. 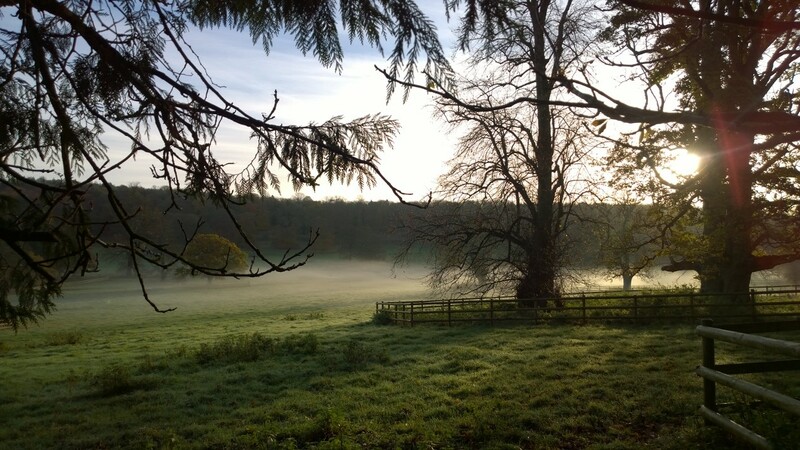 It was dawn and I was, as I often am, out walking, with David, near our Wiltshire home. I speak, if not spout, enthusiastically about the effect that being in the English countryside has on me to all who are interested or will listen. I know many of us feel similarly. Our world is fast paced. Predicted to get faster still. And I believe in some areas it will. However human beings are not designed to go faster and faster. A sprinter cannot sustain his high speed, but trains to execute it in bursts before his muscles tire. For me what often gets missed in conversations about our developing world, is what is it that we are trying to achieve? Knowing what we are looking for makes our choices much easier. Why do I walk, personally? Is it because of Foot Trails? Well, I suppose that can be argued. But I walk because I love being outdoors. I am spellbound by being in countryside. The sight of light, colours, shapes and textures fill my heart with joy. It is a discipline. Something I have worked at doing. So often that it feels it has become as natural to me as breathing. This kind of habit takes practice. But it is worth pursuing. So I walk, because there are times when I want to slow down. In these times I have my most productive thoughts, or even no thoughts at all. Walking then is almost incidental. It is my inspiration. The way I choose and love to explore the world. My mind is like a sprinter’s muscles. Sometimes it wants to run a hundred miles an hour, in excitement and joy. We need this drive to achieve things, get things done and indeed I employ this drive to help propel Foot Trails forwards with the team. But I know that to be truly whole, my mind, I, need these quiet moments in nature. Time to think, with no particular agenda. To explore what it means to be human. To make sure I am doing what makes me most happy and enables me to contribute more widely to humanity, in my own small way. All pretty cool for something as simple as a walk. Beautifully written. I share your sentiments exactly because I also steal away into nature at every chance I can find. Being in the great outdoors really does nurture the spirit and feed the soul until we are brimming over with such clarity, joy and peace.